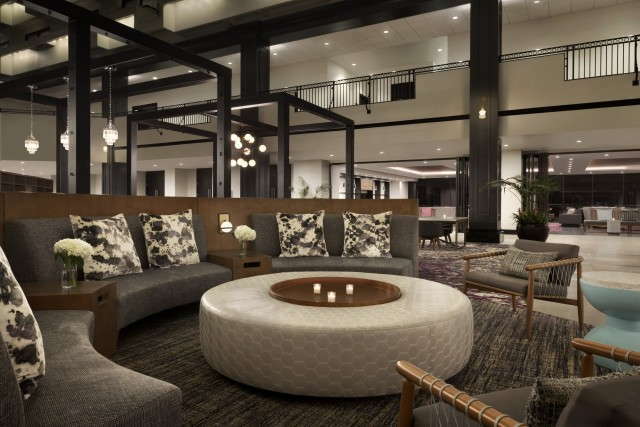 A study in modernity amid the history of River and Bay streets, the seven-story Hyatt Regency Savannah has marble floors, glass elevators, and a towering atrium. 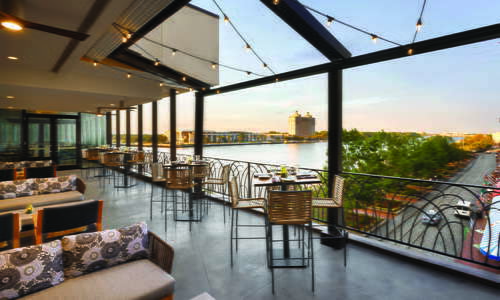 It's also closer to the waterfront than any hotel in town, and many rooms have balconies that overlook the Savannah River. The views don't come cheap, but they're priceless, especially at night. 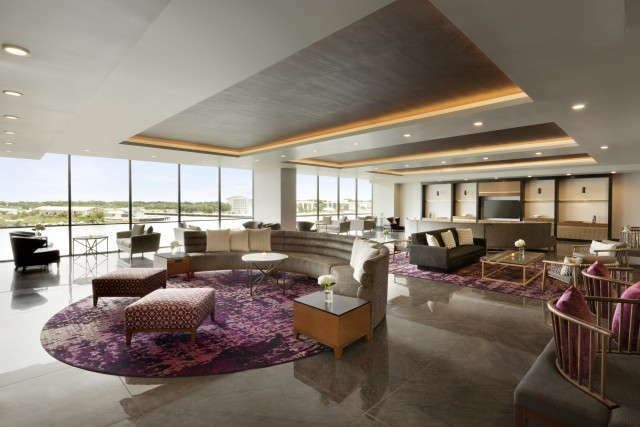 The decor, including large leather club chairs, work desks with ergonomic chairs, and flat-screen TVs, is crisp and contemporary. The indoor heated pool has great views, as does the lounge. 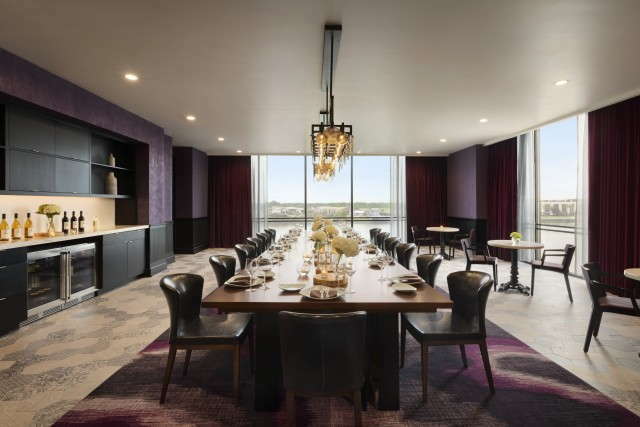 Windows Restaurant serves breakfast and lunch—choose the buffet or go à la carte. The clientele is a mix of leisure and business travelers, particularly on weekends. Photo: Moss + Oak Savannah Eatery Restaurant, Bar and Market. Guest rooms are sleek, contrasting creamy neutrals with elegant dark wood to look sharp yet serene. If doing work or just journaling about your visit to Savannah, the office set-up in each room will afford the comfort and essentials you need to stay focused. 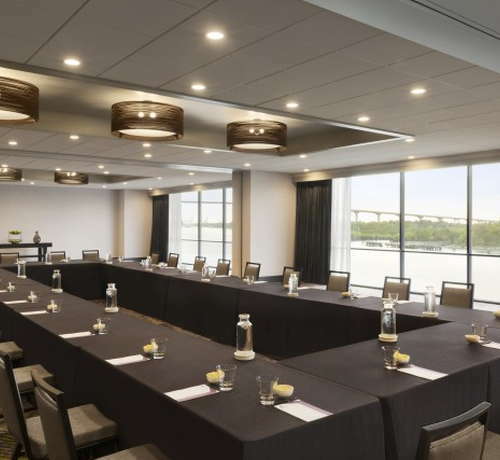 River views at the Hyatt Regency Savannah truly are exceptional because of its perch over the water, but city views from this vantage point are also postcard-perfect. Besides the great view, higher floors are also quieter. Bathrooms tend not to be large, but the fixtures are attractive, well-lit, and well-stocked with soft towels and toiletries. The ambiance, lighting, and furnishings are attractively styled, lending a sense of luxury upon entering. 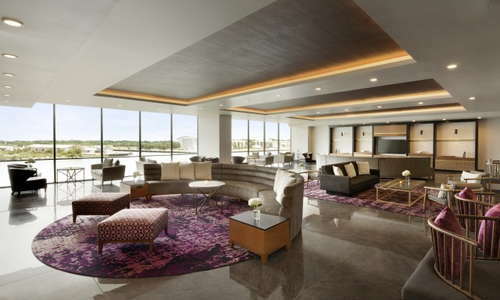 The comfortable open seating area is perfect for mingling with other guests or getting to know colleagues better away from the office. Although indoors, the pool area has a large window looking out onto the river. There is a wide assortment of functioning machines available, so guests can get exhaustive full-body workouts during their stays. 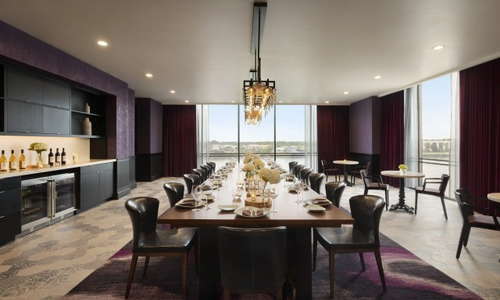 Photo: Savannah Private Dining Room perfect for intimate events. 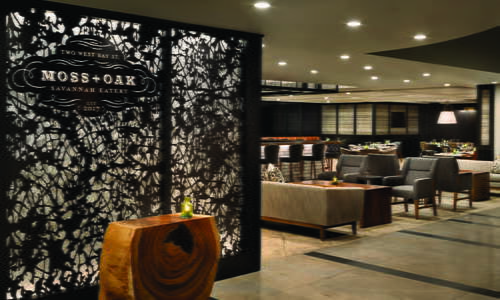 You can get your locally sourced Georgia-comfort-food fix at Moss + Oak Savannah Eatery while enjoying a river vista on the patio. There is also a convenience market for on-the-go meals. Breakfast served by Moss + Oak is delicious as well as convenient. But in such a central location, more interesting lunch and dinner options abound. Photo: Moss + Oak Savannah Eatery outdoor patio overlooking the Savannah River and River Street. A perfectly pleasant hotel lounge, Moss + Oak Bar has a great selection of local brews and liquor. Their herbs come fresh from the Hyatt Regency's own rooftop garden. The easiest and most exciting way to get around downtown Savannah is on foot, which reveals hidden courtyards and quaint shops galore. The local trolley companies that originate from the Visitors Center on MLK Boulevard also offer fascinating—and often colorful—historic tidbits while shuttling visitors around the squares and landmarks. Vic's on the River (2-minute walk) is among the best fine dining restaurants along the Bay Street/River Street corridor. The Louisiana-inspired seafood dishes and views are outstanding. Try the crawfish beignets. The Olympia Cafe (1-minute walk) has the distinction of being one of the few authentic Greek restaurants in town, and the cheerful, warm staff are always eager to ensure you love every bite. Treylor Park (4-minute walk) on Bay Street is a hip eatery with trendy decor and offbeat menu items that are surprisingly addictive. Expect a wait for Sunday brunch and come early. Rocks on the Roof (1-minute walk) is a hotspot for tourists and Savannahians alike because of its breathtaking views of the riverfront. The cocktail, wine, and beer selections are varied and the friendly staff will steer you well. Get there early to claim a spot by the firepit on breezy evenings; you can't go wrong with an order of truffle fries. Make a request at Savannah Smiles Dueling Pianos Bar (5-minute walk) and grab a drink: you're in for a raucous good time. The Savannah River, with its adorable ferries and behemoth cargo ships, is endlessly fascinating. And when you stay at the Hyatt Regency, you are as close as it gets without being in the water.